Perched above the 12th fairway of Troon North Golf Course sits this gorgeous, contemporary new-build by Standing Rock Construction and architect Andy Gramling featuring views both long and wide! 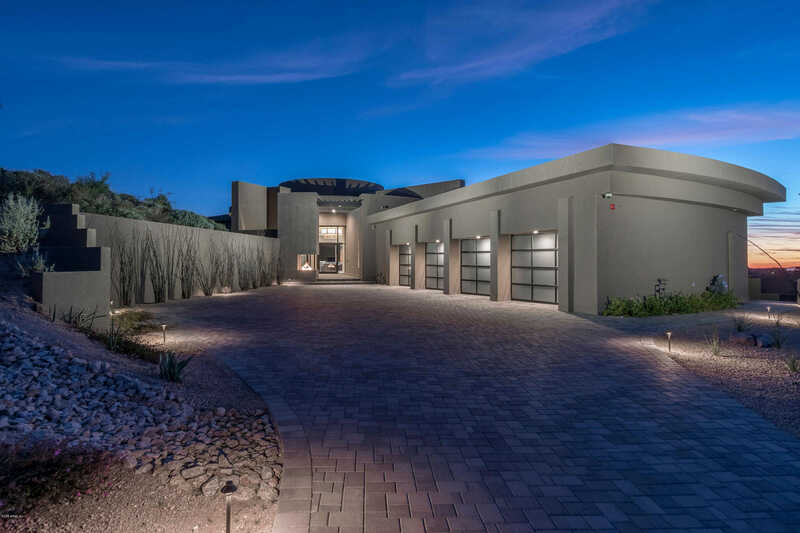 Sweeping Scottsdale city lights and mountain vistas are featured from every room in this 6,800sf masterpiece, including views of Pinnacle Peak, Tom’s Thumb, and all the way to State Farm Stadium in Glendale! The home includes 5 bedrooms, 5 full baths & 2 powder baths, 4-car garage, and has all the bells and whistles like Sub-Zero Appliances, Lutron automated shades and lighting, LED everything, and massive 10′ accordion doors to bring the mountains, city lights, & golf course right inside. Stunning fire pit, two-sided glass wine refrigerator, and walls of glass complete this desert showpiece. Directions: East on Dynamite to Alma School Road, North on Alma School Road, Left through Talus gated entrance on Troon North Drive, Left on 106th Pl, home is on Right before cul-de-sac. Approximate size: 63128.00 sq. ft. Please, send me more information on this property: MLS# 5860522 – $3,750,000 – 29568 N 106th Place, Scottsdale, AZ 85262. I would like to schedule a private showing for this property: MLS# 5860522 – $3,750,000 – 29568 N 106th Place, Scottsdale, AZ 85262.